Boynton Beach Firefighter Benevolent Association – Helping Others Through Your Help! 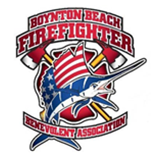 The Boynton Beach Firefighter Benevolent Association is a non-profit, fraternal organization made up of active and retired members of the Boynton Beach Fire Rescue Department. The group exists to assist the Fire Rescue Department, as well as the community at large, with various projects throughout the year. We are funded solely by donations received through our many special events that promote both Benevolent and public relations programs. Above: The BBFBA would sincerely like to thank all the fishermen, sponsors, vendors, volunteers, firefighters, retired firefighters, family and friends who gave so graciously of their time and energy to make this event one of the most successful in our history, and one of the finest tournaments in South Florida! We are pleased to donate a check in the amount of $8,000 to our charity of choice the Kiwanis Club of Boynton Beach! Left to right, Deputy Chief Greg Hoggatt, Bill Hagan, Ouida Hall, Jack Gayegian and Fire Chief Glenn Joseph. • College Tuition Scholarship Fund offering 2 annual scholarships to deserving students in the Benevolent Association’s name. • Memorial Fishing Tournament & Chili Competition – proceeds benefit the NFL Alumni “Caring for Kids” charities in the names of two of our own, Lieutenant Nick Lucente and Lieutenant Steve “Wojo” Wojciechowski, who both lost their battles with cancer while still active with BBFRD.